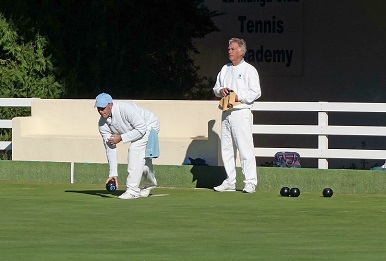 Welcome to the La Manga Bowling Club NEWS web page. We ended our busy Winter Season in great shape - 17 new members , many of them beginners ! Their enthusiasm has brought a new lease of life to the Club - 82 members now - and a healthy increase in the number of members playing in the roll-ups and competitions. We are delighted to have more bowlers who live outside the club. Support for the social events is the highest for many years and our Awards Dinner was a great success with music and dancing as well as lots of cups and trophies awarded! We are running a Summer League Competition for the first time and have over 20 players taking part. This is exciting as it is the first time in the Club's history that we have been able run a summer competition, making us an all-year club. If successful we hope to develop summer competitions further. As always, we would welcome anyone who would like to give this fascinating sport a try. Our coaching team has been boosted by Steve and Kathleen Blacklaw completing their Coaching training and all the coaches and senior members will be pleased to help you gain the skills needed.